The Mrrshan back away from no challenge… even if that means facing off against the Silicoids in hostile airspace! The crew of the Tarika Runner risk it all for the heist of a mysterious Silicoid device, putting the crew in greater danger than ever before. As they weave through the firefight, the clever Mrrshan pirates must try to pit the histories of two storied enemies against each other for safe passage. Due to character limits we're not able to post the full story in this article, but we've created a discussion thread in the community hub with the tale of the Tarika Runner in all its glory. Click here to read the full story, and feel free to ask questions about Mrrshan lore. We'll pass them on to our loremaster for answers. Welcome to the first in a series of short stories that shines the spotlight on the lore of the races in Master of Orion. If you have any questions related to Psilon lore, please leave them in the comments and we will work with our loremaster to get them answered. The Psilon have always been known as the most brilliant researchers, scientists, and academics in the galaxy. The secrets buried in their ancient libraries and sprawling research facilities point to the clues that make the universe what it is today. The Psilons have successfully hidden away one of the greatest mysteries in the universe… until a young researcher reopens the case. Discover one of many secrets the Psilon hold by following the link below. How to keep the cogs of your economy turning as you set out to conquer the stars. As in everyday life, credits make the galaxy go round. The BC (Billion Credit) is the foundation of Master of Orion’s economy. Your income has to be watched and managed just as closely as you manage your planetary resources. Each planet generates BCs at a rate that can vary over time as a planet grows, trade treaties are signed, and taxation levels change. These credits are the lifeblood of your empire; they are needed to maintain structures and fleets, provide bribes for other races, and rapidly advance production when required. Today, we will break down some of the factors affecting BC generation and explain your options for spending those piles of credits sitting in your imperial vaults. Taxes affect all colonies in your empire at the same rate. You may set the tax rate from 0% up to 50%. Tax rates are set on your Empire Management screen. As you adjust the tax rate, you can see how the new rate will affect your overall per-turn credit generation as well as how each planet will be affected. Be careful, because setting the tax rate too high will upset your population, leading them to go on strike (which then reduces your planet’s ability to generate resources). Numerous technologies in the research tree can help boost your economy. These technologies are located mainly on the top technology line and can be easily identified by their yellow symbol. They can also be viewed by using the “Highlight” dropdown menu in the upper left corner and selecting “Economy;" all other technologies will grey out. 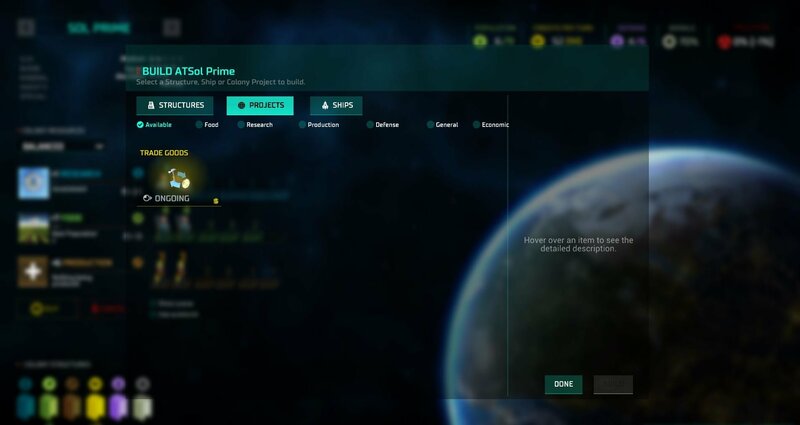 Technologies help your economy by providing simple credit boosts, reductions to the cost of structure and ship buy-outs, increases in tax revenues, and, at the highest stage, a 100% increase to credits generated by your entire empire! When your empire begins to meet other races, one option in your diplomatic relations is a Trade Treaty. These treaties usually last 20 turns, with your empire receiving credits every turn. Once the treaty runs out your advisor will provide a report indicating how many BCs in total were generated--which can run into the thousands! Be careful though! The other race is also receiving credits (and if war is declared all treaties are immediately canceled). Another way to generate credits is to put some colonists to work producing trade goods. Under your Build pop-up screen, choose “Projects” and then “Trade Goods." Your colonists will then begin to build consumer items that others will buy. The effect will turn 50% of the planet’s production value into credits (which is much better than letting that production sit idle). Virtually every structure and ship within your empire costs credits to maintain. Of these, your ships will probably be the most costly, especially as more technology is added that increases their maintenance cost. A large fleet sitting idle will rapidly become a drain on your economy. This maintenance is automatic, requiring no decisions on your part. However, if your economy goes into the negative, your advisor will begin to scrap ships and structures that cannot be supported (you will be told when this occurs and what was scrapped). The best way to avoid this is to maintain both a positive income each turn and a credit reserve. Such actions will help you make it through periods of high maintenance costs but low production, such as when you are sending a large combat fleet a long distance to attack an opponent. If you decide that you need that new ship or structure NOW instead of 12 turns from now, you can spend credits to speed things up. The item currently being produced in the production queue can simply be bought if you have the credits available. Once bought out, the structure or ship will be available the following turn. This is an all-or-nothing action--you may not partially pay for the item to decrease its production time by a few turns. To buy out something in the production queue, simply grab the item and drag and drop it on the “BC BUY” button. If the buy-out number is in red you do not have enough credits to pay for the item. Note that as your colonists build the item the buy-out price will drop each turn. Sometimes in diplomatic negotiations the other side will request BCs to agree to your propositions. Having a pile of credits can help grease these diplomatic wheels if what you desire is worth the price being asked. This decision must be weighed against the fact that the other empire will receive those credits. You will have no way of knowing what the credits will be used for: to buy out some toxic condensers or build that Titan that will spearhead the attack on your empire. Your empire is generating and spending credits but how do you check the overall health of the economy? In two places in the Master of Orion interface you can get both a quick answer to this question and a more detailed report. One place is on the main screen and the other is in the Empire management screen; in both areas the same information is provided. On the main screen in the upper left corner, next to the yellow BC symbol, is the overall state of your economy. The first number is the amount of available credits at that moment. The number in parentheses is how many credits you are generating per turn through taxes, treaties, etc. If the second number is negative (displayed in red), that is how many credits will be deducted from your available balance at the start of the next turn. If you hover your cursor over the basic BC information, a much more detailed report on the state of your economy will pop up. This report breaks down credits received and deducted through taxes, treaties, upkeep, fleet costs, and so on. All of this data will be of great value, helping ensure your empire maintains a healthy economic foundation while you conquer the galaxy! We hope you enjoyed this look at the Master of Orion economy. Stay tuned for additional deep-dives into the game systems and mechanics as development continues! 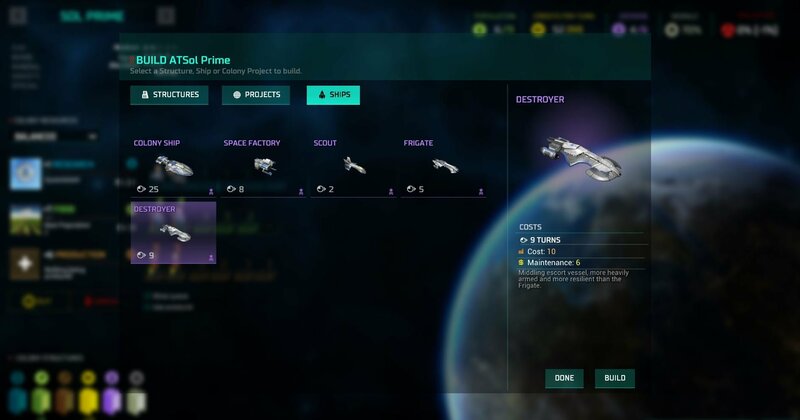 Please note: The information in this article is based on a "work-in-progress" build of Master of Orion and the information included is subject to change. 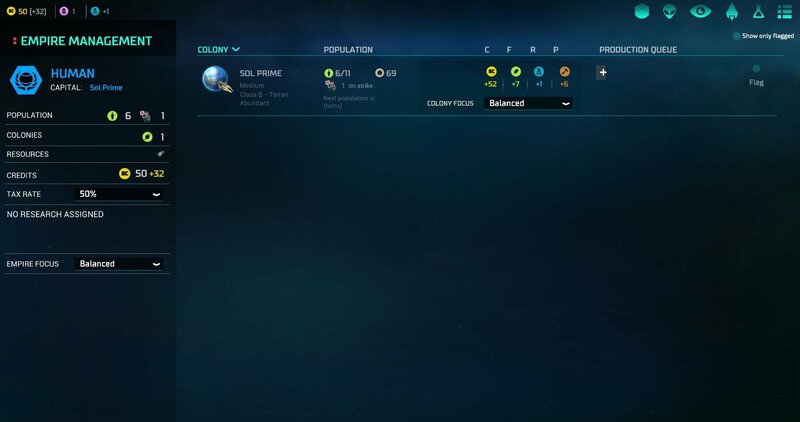 BEFORE SETTING UP BASE MAKE SURE TO READ THIS HANDY GUIDE, TO FIND OUT WHICH PLANETS ARE THE BEST (AND WORST) TO COLONIZE. In your quest to conquer the stars, an intrepid explorer needs to know their galaxies and planetary systems so they can lay the foundations for greatness. We’re here to breakdown what types of planets you’ll discover in your journey. There are a variety of planet sizes scattered around Master of Orion’s many galaxies. However, size isn’t everything, which you’ll discover later. Huge: The biggest astrological bodies revolving around a star. An explorer won’t find any bigger or better out there. These should always capture your interest. Giant: A gas giant is not able to be colonized until it has been terraformed, where it then will transform into a “huge” planet. Large: Third in the list. It’s big. Not as big as Giant. Generally around the size of Earth. Medium: Explorers should be getting the hang of this now. Small: The smallest of the bunch, but that doesn’t mean they aren’t rich in resources. Biome is, basically, the makeup of a planet—what’s there worth taking. Gas Giant: Full of, you guessed it, gas. Class A: “Gaia” -- the motherlode, El Dorado—rare worlds with extraordinarily rich ecosystems. These should always be your first port of call. Class B: “Ocean” – planets whose surfaces are mostly covered with large bodies of water. “Terran” – You’ll find abundant flora, fauna and water supplies here. Class C: “Swamp” – Heavily layered with dense, jungle-like vegetation. “Tundra” – frigid environments featuring permafrost and harsh weather. “Desert” – Harsh weather conditions and very little water are their most common features. Class F: “Barren” -- Barren lands with a basic breathable atmosphere. “Radiated” – They do not have atmosphere due to their star’s emissions. “Toxic” – Totally inhospitable environments. Not a place you want to vacation. He who controls the minerals controls the universe. Harnessing the power of minerals allows explorers to increase production and kick their campaign into hyperspace. Another vital statistic to bear in mind before colonisation is the planet’s gravity. The gravity of a planet can be low, normal or high, with normal being preferable. This characteristic can result in your production being reduced by 50%, which no intrepid explorer wants. 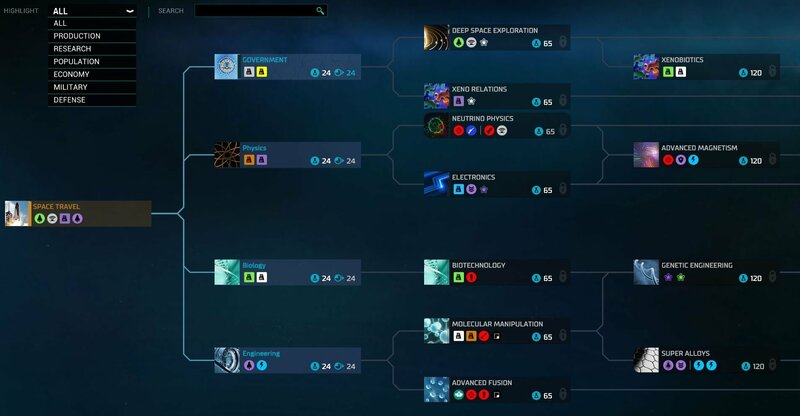 For example, Gold can affect your income for the better by giving you extra credits, while an artifact will boost the research for the colony. During your explorations, you will notice that there will be asteroid fields - be wary though, these might be home to many a pirate, who is looking for any opportunity to loot you. Hopefully this guide will help you on your way to becoming the greatest leader Orion has ever seen. Stay tuned for more installments to learn even more about Master of Orion! If you are wondering what awaits you in your interstellar campaign, we have just the video for you! The quirky hosts of the Galactic News Network will be your guide to the fearsome Sakkra and the ancient and intelligent Psilon Quanta. Take a cruise around planets, upgrading tech modules, waging warfare on space pirates, and practicing your negotiation skills. Stay tuned for more exciting videos in the future! Who is behind Master of Orion? Wargaming is proud to unveil WG Labs, a lean, agile platform set to foster innovation within the video games industry. WG Labs will support external development teams in game creation and publishing. It will also generate, evaluate and launch in-house products that go beyond Wargaming’s niche of military warfare. WG Labs lets Wargaming expand and experiment with new platforms, services, game mechanics and business models to bring some truly great gaming experiences to market. So, what kind of projects are WG Labs interested in seeing? Playable prototypes and Alpha/Beta/Pre-Release versions of games are all accepted, with no restrictions to the platforms people want to submit their projects across. If you have the next big idea set to revolutionise the way we play and think of games, then you should check out WG Labs. As long as the development teams are able to deliver an exceptional product in line with their own vision, Wargaming is interested. With this partnership, WG Labs will help support game production, monetisation, analytics, marketing, customer services, QA, as well as other areas. The second installment of WG Labs’ Master of Orion Developer Diaries blasts right back to the beginning, to over 20 years ago, when Master of Orion first landed at MicroProse. Some of the staff involved in the first games talk about their early memories of the original Master of Orion and how they brought the game to life. Learn how the team took a game that was rough around the edges (originally named Star Lords) and worked their magic to create a title that would lay the blueprint for eXplore, eXpand, eXploit, and eXterminate gameplay for years to come. Stay tuned for further installments to learn even more about Master of Orion! AN EXCLUSIVE RACE, ALL THREE ORIGINAL GAMES, EARLY ACCESS, AND MUCH MORE CAN BE YOURS IN THIS PRESTIGIOUS EDITION! The Master of Orion Collector’s Edition is coming soon, opening up a galaxy of fantastic content and launching you into hyperspace. The bundle includes the first three genre-defining Master of Orion titles, a beautifully detailed digital art book, the modernized orchestral soundtrack, a special retro art style graphics option, and an exclusive race only available with the Collector’s Edition: the Terran Khanate. Collectors can also begin their campaign ahead of the fleet with Early Access, once available. Visit the Pre-order page for more information. First Developer Diary is here! Looking for more information on Master of Orion straight from folks who are developing the game? You’re in luck! In our first Developer Diary video, members of the development team -- several of whom also worked on the original Master of Orion -- discuss the series’ rich history as well as the new game’s lore, artwork and soundtrack. The reimagined Alkari and Mrrshan races make appearances as well! This Developer Diary is the first in a series; check back soon for the next installment.